Aside from the hypocrisy and improbable economics of a Bernie Sanders presidency, or the Assad-friendliness of a Tulsi Gabbard presidency, there is one last member of the now 18-person Democratic presidential candidate list that I cannot, in good faith, put any support behind: Andrew Yang. Allow me to give a few examples of this trend among his positions. Consider the plan to establish a “Public Council of Advisors,” where the president would appoint consulting agents from whom he would seek advice on different assigned topics. Presumably, he decided to ignore the existence of councils that already existed in advisory capacity to the presidency, like the President’s Management Advisory Board, in order to propose the idea as something he came up with. Or maybe consider his ridiculous “Foreign Policy First” topic, where he discusses the actually reasonable idea of changing American diplomacy. Yang wants to transfer many responsibilities from the Department of Defense (DoD) to the State Department by increasing State Department funding, and utterly ignoring that quite a few of the American interventions across the world for the War on Terror have massively reduced terrorist threats in the United States. Yang also demands regular DoD audits, when the DoD has been undergoing an audit for the past 28 years, which has revealed that the Pentagon’s waste has been statistically minimal for such a large organization. But hey, he’s supporting the State Department, something we should never have stopped funding consistently in the first place. Or not, since then in his plan to “Limit Bureaucracy in the Federal Workforce,” he outlines a decision to “hire a management consulting firm to identify areas of inefficiency in the federal workforce” and then cut 15 to 20 percent of the workers involved. In this incredibly vague proposal, where he assumes that any private consulting firm can solve the government’s problems, he outlines cuts more massive than any federal cut proposal in the history of the country, and this is after the fact that GOP cuts have left the government bureaucracy more critically understaffed than it has been in the last 40 years. I could go on, for each of the hundred policies he addresses, but I imagine you get the point, so I’ll summarize the trend. 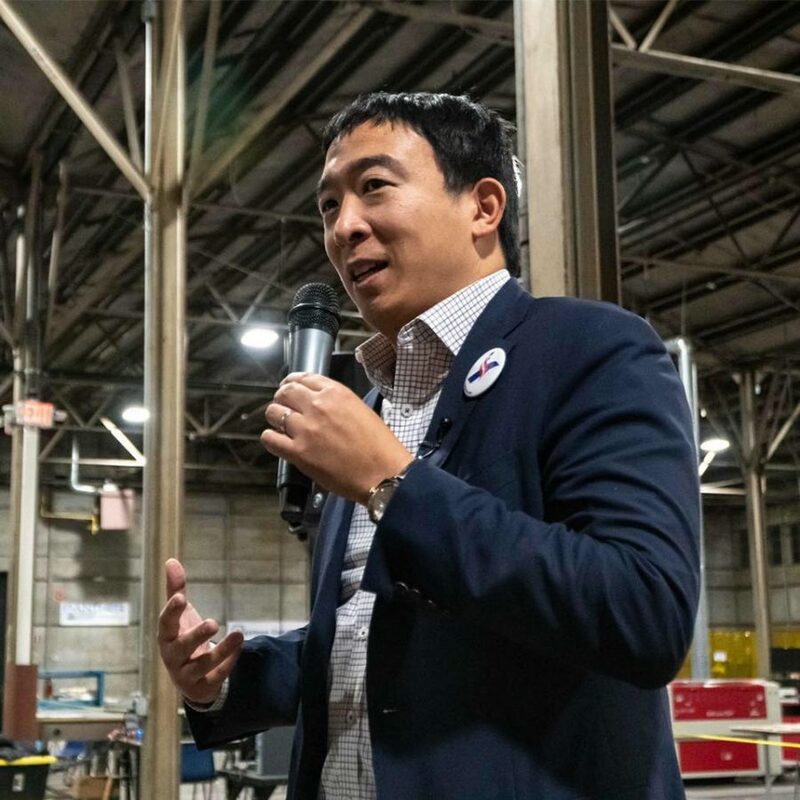 Yang approaches the problems of government the way an eager venture capitalist with too many advisors would approach creating a startup: with plenty of vision, broad and sweeping solutions, and absolutely no introspection on any of it. He relies massively on a belief that as president, his control of the country would reflect a CEO’s or majority stockholder’s control of a company. Sounds familiar? If this isn’t obvious already, he suggests an old political classic of “Rebuild American Infrastructure,” except to achieve it, he proposes the most egregiously unconstitutional policies I’ve heard since sedition laws. He proposes a new branch of the military focused on improving domestic infrastructure that would be called the “Legion of Builders and Destroyers,”because apparently we’ve adopted naming schemes from 1980s Saturday morning cartoon villains, which would be commanded at the whim of the president and have the ability to practically ignore all local laws. Finally, Yang ignores evidence pointing out flaws in his policies. Vote for somebody else, for heaven’s sake, somebody with a grasp of what they’re doing, if you want to fix this nation’s problems. For all three designs, enacting a UBI and paying for it by increasing the federal debt would grow the economy.Underthe smallest spending scenario, $250 per month for each child, GDP is0.79% larger than underthe baselineforecastafter eight years. The model finds that the largest cash program -$1,000 for all adultsannually -expandsthe economyby 12.56% over the baselineaftereight years. Aftereight years of enactment,the stimulative effects of the program dissipate andGDP growth returns tothe baselineforecast, butthe level of outputremainspermanently higher.•When paying for the policy by increasing taxes onhouseholds, the Levymodel forecasts no effect on the economy.In effect, it givesto households with one hand what it is takesaway with the other.•However, whenthe model is adapted to includedistributionaleffects, theeconomy grows, even in the tax-financed scenarios. This occurs because the distributionalmodel incorporates the idea thatan extra dollar in the hands of lower income households leads to higher spending. In other words,the households that pay more in taxes than they receive in cash assistance have a low propensity to consume, and those that receive more in assistance than they pay in taxes have a high propensity to consume. Thus, even when the policy is tax-rather than debt-financed, there is an increase in output, employment, prices, and wages. Good article, though I strongly disagree with your analysis. I’ll start with the Freedom Dividend and move towards the other policies you critique. Your claim of contradiction just isn’t? “[T]he economy grows, even in tax-financed scenarios” is a pretty clear agreement of the claim that the UBI would increase economic growth. If not the full 10%, even a 5% agreement would still be a strong improvement in the economy, and there’s no reason to assume it’d be far less than the assumed amount. While I agree with the question of oversight of the Legion of Builders and Destroyers, I think that’s not a particularly strong reason for dismissal. One of the most important issues for Americans is infrastructure: (http://www.rasmussenreports.com/public_content/politics/general_politics/january_2019/most_voters_say_improving_infrastructure_is_important_for_u_s_economy_future_generations), and the name if anything inspires actual action rather than one of these “Commissions for Infrastructure Creation, Maintenance, and Removal” or similar dry & drab names. He’s made it clear that the government is not, in fact a business. This has been an issue in multiple interviews he’s partaken in, and he’s highlighted it. The government is not a company, it is not a business. He wants to run it based off of clear-cut policy and research, sure, but he is not going at it as a ruthless CEO or something. On staffing: I think while he wants to cut federal employees, he wants to consolidate governmental agencies. The issue is a significant amount of agencies share similar roles and lead to redundancies, and obviously removing redundant roles would greatly reduce the amount of employees in the federal government. You give Andrew Yang far, far less credit than you ought to, especially compared to democratic candidates such as Beto O’Rourke, Pete Buttigieg, and Cory Booker, who have ephemeral positions beyond being some type of “charismatic” and in the case of the latter two, running in part due to their diversity status. First, the Roosevelt report very clearly states that the tax based system makes for an economy that relies on multiplier effects for slight growth on the demand side, which has been proven unreliable by not only reports from the Cato Institute and actual testing in the country of Finland. I am pointing out in this article that not only is Yang’s claim disingenuous, but the cited analysis concludes bare minimum growth estimates that are unreliable and absolutely not worth the secondary VAT inflation growth given real-life testing. Finally, there are factors that the Roosevelt report relies on that inherently bring out the fact that Yang has completely ignored the basis of the study. First, the report, which will outright say this, assumes that the economy is performing well below capacity, which… yes, printing money during times of economic crisis is in the rulebook already. It also assumes the VAT will not change consumption behavior in families, and that the income will not change work patterns or frictional unemployment patterns of receivers. I do think that if the “Legion” had a different name, I might’ve been less noticing of its presence, but the fact that his plan is to establish a part of the federal government that operates DOMESTICALLY under the behest of one person while being able utterly ignore the concept of federalism is unacceptable. There is also the fact thatthe government already does its own policy research a large majority of the time, and the fact that he assumes consulting agencies can just come up with solutions when there are hundreds of the brightest minds on earth in the federal government and the countless think tanks around it attempting to do so should probably speak for itself. He may say he doesn’t think of the government as a company, but he doesn’t seem to show that he actually understands this. I do agree that he is not, in fact, a ruthless person. Comes across as a very nice one. Additionally, the redundancy you speak of is measurable to the number of $45 billion dollars. Unfortunately, the report identifies that the “redundancy” measures is mostly co-inhabitive and do not actually overlap on the ground, thus meaning that all merges would do is save a few million and actually provide fewer jobs for people in the federal government. Finally, I take offense to the assumption that Pete Buttigieg and Cory Booker rely on some kind of diversity quota, because both are well accomplished and should never be reduced to their sexuality or the color of their skin. Buttigieg is a graduate of not just the first best college in the world, but also the second, having attended both Harvard and Oxford on likely the most prestigious scholarship program in the world, the Rhodes Scholarship. He served in our armed forces as an intelligence officer for 8 years and completed a tour of duty in one of the world’s hotzones. Finally, his policy programs are far from barebones, and are quite available to see. As for Cory Booker, I think it is beyond insult to a Stanford/Yale graduate whose political career goes back twenty years to say that he is doing so because of “diversity status”. If you want Booker’s policy, consider his three years as a senator for the United States Congress, which is strong enough to mark his views very easily.